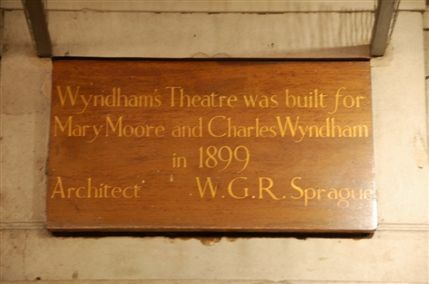 Wyndham's Theatre opened in Charing Cross Road on 16th November 1899 and was owned by Charles Wyndham. One of its biggest hits was Sandy Wilson's The Boy Friend which ran for 2078 performances before transferring to Broadway. During the sixties and early seventies, stars such as Alec Guinness, Vanessa Redgrave and Diana Rigg all took to its stage. In 1972, Wyndham's was home to one of the biggest hits of the decade - Godspell. More recent times have seen the world premiere of The Ride Down Mount Morgan by Arthur Miller, the British premiere of Edward Albee's Three Tall Women and the West End run of The History Boys. From 2008 to 2009 the theatre was also home to The Donmar's year-long West End season which featured productions of Ivanov starring Kenneth Branagh, Twelfth Night with Derek Jacobi, Madame de Sade featuring Judi Dench and Hamlet with Jude Law in the title tole.